MasterChef last night arrived at its Top 10 for 2017 after Nicole Stevenson, 24 of Queensland, was eliminated during a bajan fish pressure test. Next week 9 of them will head to Japan for a week of Asian cuisine. Here are the top 10… who are you tipping to win? Arum’s confidence has grown throughout the competition, after he secured the very last apron available in the Top 24. After losing the first two team challenges, the Englishman found his stride in Sweet Week. It was his first pressure test, completing Deniz Karaca’s challenging Passion for Caramel Tart, which made him realise just how much he wants to win this competition. After surviving Paul Carmichael’s bajan fish fry elimination challenge, he believes he can now win any challenge to get there. Ben found his feet cooking in David Thompson’s Thai- inspired challenges and gained his first victory in an invention test. It was followed a week later by a tasting in Yotam Ottolenghi’s mystery box. With each cook, the father of three has gained confidence, inspired further as one of only three contestants not put into elimination during Heston Week. A lover of weird, wacky and wonderful ways to cook, the teenage sensation affectionately named “Mini Heston” would love nothing more than to take out this competition. With a strong focus on sweets, Callan has marveled the judges with flavours including pairing icy granita with soup, which prompted Thai cuisine legend David Thompson to declare he hated a dish that was so smart. Captaining his team to victory in Yotam Ottolenghi’s challenge at Bertie’s Butcher, Callan is one to watch. With an impressive record boasting five mystery box tastings, including one win, and twice named top three in an invention test, Diana has showcased an array of impressive skills. Victorious in Sweet Week’s invention test with a strawberries and cream ice cream, and in multiple savoury challenges, Diana’s calm and measured approach in the kitchen has allowed her to consistently plate up impressive food. She captained her team to a win in the first team challenge for the season at Gradi and her dishes have been the most tasted in the competition. A strong contender across both sweet and savoury, Eliza secured her apron in the Top 24 following an impressive profiterole cook using lemons in Maggie Beer’s challenge. Twice scoring places in both the mystery box tastings and invention test top three, she has proved a solid cook, successfully cooking throughout Heston Week without finding herself in elimination. As the only winner of a coveted immunity pin, after an incredible waffle dish in round one and an indulgent chocolate mousse against Charlie Carrington in round two, Eloise has been plating up interesting and decadent dishes, often using her signature whiskey flavour. Twice securing a place in the invention test top three and tasted twice in a mystery box with one win to her name, Eloise survived her first pressure test cooking Yotam Ottolenghi’s mezze feast. The Sydney copywriter with a passion for interior design has wowed the judges with her flavorsome and often Asian-inspired dishes. Routinely top of the class, she has had three mystery box tastings of which two won her back-to-back advantages with David Thompson and Yotam Ottolenghi. She has twice been named top three for the invention test and won Curtis Stone’s invention test, securing her a coveted Power Pin. Captaining her team to victory in Matt Sinclair’s pop-up challenge, Karlie is a powerhouse. Ocean Grove’s Sam has cemented his place in the Top 10, securing a mystery box win and twice named top three in an invention test. Cooking for his idol Ben Shewry was a highlight and he was praised for his smoked rice ice cream, which secured him his first invention test placing. Having survived both Josue Lopez and Deniz Karaca’s feared pressure tests, Sam’s methodical and calm demeanour makes him one to watch in MasterChef Australia. With a strong Malaysian background, Sarah has routinely cooked well in the competition, competing twice now against two professional chefs, although both times just missing out on a pin. To take her place in the first immunity cook, she cooked a dish using bok choy which Gary said completely changed his take on the vegetable. 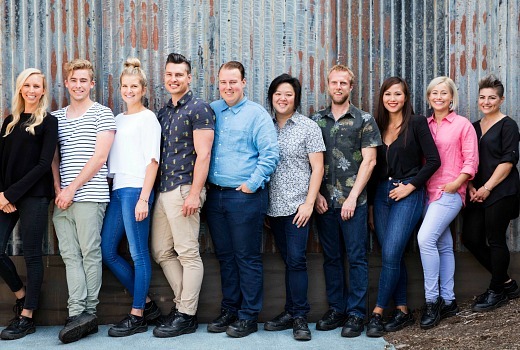 After securing her apron in the Top 24 following an impressive Malaysian pancake in Maggie Beer’s lemon challenge, Sarah established herself as a solid performer, claiming early victories in home cooking week, Ben Shewry’s invention test and Sweet Week. Now named three times for mystery box tasting and three times securing a top place in an invention test, Sarah also captained her team to victory in the glasshouse challenge. No one in the competition has had a journey as eventful as Tamara. Over one week alone, she was in the bottom four in Curtis Stone’s invention test, eliminated the following night in Deniz Karaca’s pressure test, and then reclaimed her apron the following night when she battled the other 11 eliminated contestants for a spot back in the competition. At the end of that week, she also survived pot luck elimination after her team’s loss in the pop-up challenge. Plating jam-packed flavoursome dishes, Tamara has often relied on chillies, using the spicy ingredient to win a mac and cheese challenge. But clearly the judges and producers love Tamara, just like last year how it was The Matt Show, and the year before it was The Georgia Show, this year its all about The Tamara Show…. So over her and her talking to camera 79 times an episode!!! Sorry to see Nicole go, but she wasn’t the best cook. Dunno how Arum continues to stay in, he’s a real survivor…outwit outlast survive. With the amount of face time to camera Tamara gets, she may as well be narrating the show. Sarah or Diana will win.,,,,despite Tamara being the judges very obvious favourite. Tamara will be taken through to final 3 or 4, as per the Young Blonde Female script. I agree that Sarah or Diana are the best cooks, but Ben is also a chance.